LatinaLista — Honduras is a hard country to live in. It ranks as having a murder rate ten times the global average; it is the second poorest country in Central America; and gang violence rivals drug cartels. For a poor child growing up in Honduras, the odds of successfully getting an education is extremely low. Although school is provided by the government through the 5th grade many children are unable to attend because their families can not afford uniforms and school supplies. In 10 of the 18 departments Honduras is divided more than 90% of the students need to repeat grades. Only 51% of children registered complete primary school. The average time it takes a child to finish first through sixth grade is 9.4 years. This is due, in part, to the necessity of the child to contribute to the family’s income. The number of dropouts increases every year. The acutest problem is that the basic educational system only covers 86.5% of school-age children, while the remaining 13.5% have no access to education. Poor families have almost no access to education beyond the 6th grade in Honduras. Only 30% of all Honduran children go to High School. The government does not provide free education past the 6th grade. In 2000, in the Honduran town of La Entrada, one teacher, Paty Villanueva, saw too many impoverished families unable to pay the fees and uniform costs to send their children to school and instead were sending them to sell on the streets. The loss in potential and the likelihood that these children would only continue the cycle of poverty without an education was enough to spur Villanueva into action. She co-founded a special school for the children of La Entrada called Hearts for Honduras School. The school not only provides children an education, including English and computer classes but also gives them a nutritious meal each day, vitamins, and basic medical and dental care, all taught in a Christian-based environment. The school has had the good fortune of being adopted by Liberty Corner Presbyterian Church in New Jersey. The congregation established the Friends of the Hearts for Honduras whose donations have built more classrooms, bought supplies and uniforms for the students. In addition, many in the congregation make annual visits to the school to help out with teaching, construction and whatever else is needed. Yet, the one constant is money. To help raise money for the school, as well as, spread the story of Paty Villanueva’s journey in founding Hearts for Honduras, a bilingual children’s book about La Entrada children and their school has been published. 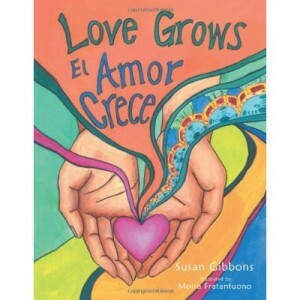 Author Susan Gibbons, who makes trips to Honduras to help out at the school, chose to publish Love Grows/El Amor Crece as a children’s tale for her son’s kindergarten class Valentine’s Day celebration. Intended as a lesson of how to honor the spirit of the holiday year round, the story was so popular she decided to publish it. To carry the lesson even further, Gibbons is donating 100 percent of the sale proceeds to the Friends of Heart for Honduras Foundation, explaining that it’s a way to introduce children to the concept of doing social good since they will be directly helping the Honduran children with the purchase. When the school opened, they started with one teacher and 23 first-graders. Today, the school serves almost 200 students in six grades. Each student graduates with a diploma and a Microsoft-certified certificate. Many have gone on to high school with dreams of continuing on to college — and a better life than what they started with.